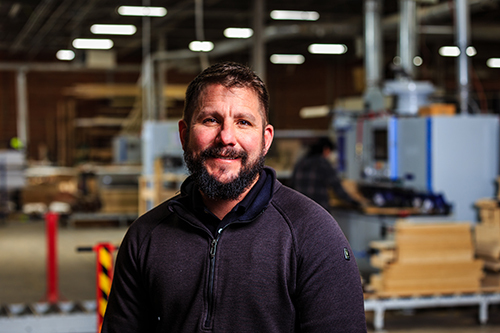 Project Manager and native Edmondite Zack Boilla has been with EGR Millwork|Casework since 2016. Boilla got his start as an installer and worked in the field for eight years before moving front of house as a project manager. With more than 20 years’ experience in managing projects, Boilla is also a carpenter by trade, who brings a meticulous eye for detail and design to every job. On any given project, my scope of work includes working with everybody at EGR, hand in hand to make sure the materials get here, and we meet our deadlines. I make sure the installers get to the job to handle the installation process. I also help with the engineering on quite a few pieces that we do. I helped create the art tree and display cases at the new Choctaw Headquarters in Durant. Biggest challenge on any given job? Change orders. They inevitably happen, then you are still expected to get the job done on the same expedited schedule. Classical. I like contemporary, but it’s tough to pull off because you mostly have to start with a slab. Do Project Managers get a bad rap? Yes. Honestly, when I went into this 20 years ago, I never thought I would have to be the bad guy every day but it’s my job to make sure things get done right the first time. That can be tough. How do you stay positive? As I get older, I strive to disconnect when I go home from work, but I feel like if you really love your job, you can’t ever seem to totally disconnect. And that’s not good, so for me, I have two phones and I do my best to leave my work phone in the truck after work, but it never fails…I want to check that email! What’s the most gratifying part of the job? The projects. Just to see them finished. I am a carpenter by trade and to see the cool stuff that we pull off – that’s fun! Years ago, I worked on Midfirst Bank at Grand and Western in Oklahoma City – I did all the wood interiors and helped with the install. I have a dog, a Boxer. He just doesn’t get it. At every doggy daycare, he picks a fight with the biggest dog and he has NO TEETH!